Crock Pot Apple Butter is one of the easiest things to make. It cooks for a while, but the prep and actual “work” is next to nill. This was my first time making apple butter, and I’m so thankful to all my Facebook friends that shared their favorite recipes with me. 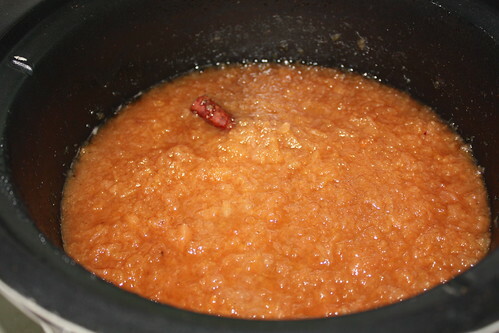 I experimented a little, followed my instincts, and here’s what I did for Crock Pot Apple Butter. Step One: Start out in the morning and cut, peel and core your apples. This is the only “real work” you have to do. Step Two: Fill your crock pot with apples. Step Two: Add in 2 cups of unfiltered apple juice (I used RW Knudsen’s organic one – on sale BOGO at Kroger this week!). Step Three: Put the lid on and cook on high for the day, and turn to medium at night. Grab lunch, hang out with the kids, and enjoy the smell! By the way, you won’t have to light candles or use room fragrance for several days! Mmm…. Step Five: Later that evening, take the lid off and let all the extra liquid cook off (a few hours). If it’s nice and thick and glossy, then it’s done! 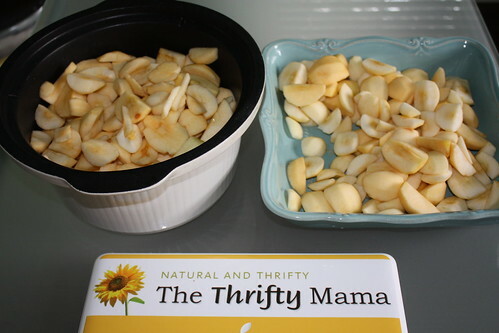 Pull out the cinnamon sticks, and transfer it to a container for canning, freezing or refrigeration. Makes 1 quart. Ours went straight from the pot to our mouths, and in the fridge went the leftovers! It is so yummy, I doubt it will last long around here. Apples are cheap and in season right now, and you can find some great deals at the farmer’s market. So grab some deals, and make some easy Crock Pot Apple Butter! Not in the mood to make your own homemade crock pot apple butter? Here’s how to freeze apples, so that you can store your apples for upcoming smoothies, pies, apple and oats breakfast pudding and more! And if you’re really feeling adventurous, make your own apple juice! Can I put leftovers in ziplocks & into the freezer? I dont know that my husband likes this & I dont know the first thing about canning stuff. Yes, you can definitely freeze it that way! That does look yummy! LOL – I really like mine on crispy thin fried mush. We used to have that when I was little. Yep, that is all I had. Pampered Chef makes an Apple slicer that peels, slices, and cores the apple with a crank of a handle. You can use it for potatoes too. The only thing I had troubles with was the apples all should be the same size. I gave mine to my sister-in-law who makes apple pie all the time when I no longer used it. She loves it. Yummy. 🙂 I might have to come over and eat some, lol. BTW, Good tip Dianna. I have an apple slicer, but not one that peels. ok question…how in the world do that many apples fit into the croc pot?? And after all of that you only get 1 quart? 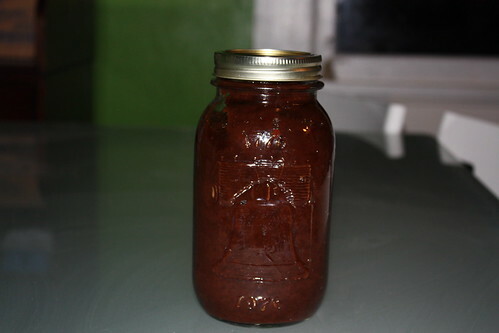 I have never made apple butter or canned before but was hoping to do some this fall. Love your blog first of all. I made the apple/oatmeal with steel cut oats and let it soak overnight….it was great. I am goign to make another batch…I am hoping the fiber will help keep me full on my diet. We are doing the apples for the apple butter right now! Thanks for all you do….really enjoy your blog. yet another thing i want to try this weekend! I love the Crock Pot Girls! Thanks so much for posting. I will be making some this fall!!! i love crock pot apple butter. its the best! easy, and yummy! I’m looking forward to driving up to the mountains in about a month and buying farm fresh apples and making it then! How long will the Apple Butter keep if I put in the jars in the fridge…thinking about incorporating some into a basket for Christmas gifts!! We try to avoid sugar–could I use syrup or honey instead? Tried this yesterday and it came out great. I didn’t let it cook as long as the recipe recommended (~12 hours on High and ~8 on low at night) but it seems fine. Mine is darker than the images and I ran it through the blender to smooth it out (butter, not jam) and it tastes great on biscuits and English muffins. I ended up with a quart and a half.